We had such an eventful day yesterday. I will get more into that later on today. Right now, I want to focus on my little boy and all the expectations we are placing on him. 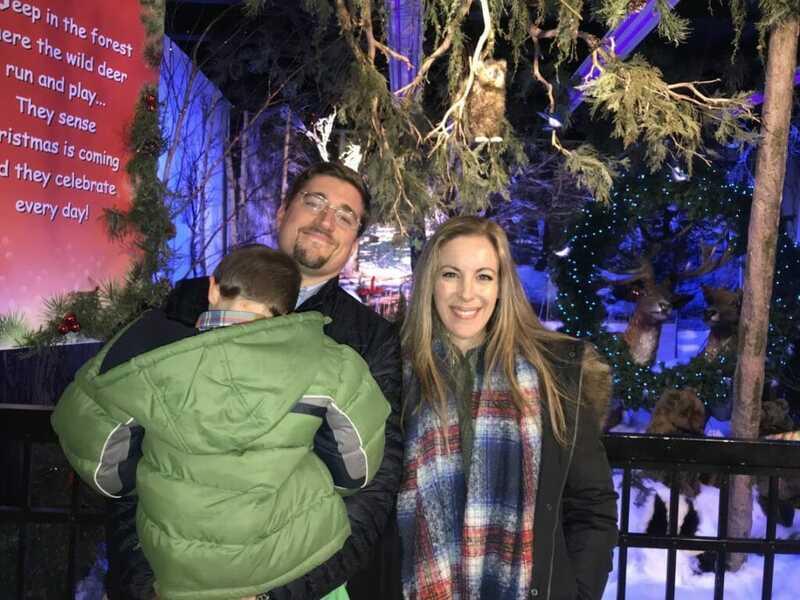 After a full day in the city, a visit with grandma, and then impromptu shopping for last minute school clothing for Liam, we had the audacity to expect Caleb to still be in a festive spirit while walking through a Christmas village. We even saw Santa walking off of his shift and asked Caleb if he wanted to try to get a picture with him. Guess what he said? NO! He was done. Spent. And you know what? I feel the same exact way this holiday season. The day after Thanksgiving, I was OUT FOR THE COUNT with vertigo. A full day of it. I couldn’t move. On that day, I usually make a huge meal for the kids while they decorate the house. It’s a wonderful tradition that we do. But because I literally couldn’t move, our schedule got completely messed up. Because we didn’t take care of the house that day, our tree isn’t even up yet. This is the first time in 16 years of marriage that our house isn’t ready for Christmas. As far as Christmas cards go, I didn’t even take any good shots this year. I looked on my phone, grabbed a few family photos and called it a day. Usually, I buy everyone outfits and place them in front of the fireplace. Not this year. This year, it’s iPhone + winter jackets + no filters. I think everyone is just spent. It just seems that the holiday is growing with bigger and bigger expectations as we age. One card after the next filled with professional photos – all staged with Photoshopped themes. Literally. This isn’t an exaggeration. I guess I’m just getting so tired of it all because it feels so very heavy. So, when I saw Caleb losing his mind last night, I realized what I was doing. I was doing to him what society was doing to me. And it was terrible. We shouldn’t have packed in so much in one day. I get it. I was even tired by that point. We ran around like crazy. I mean, we didn’t even have time for church and we really try not to miss these days! So, I guess yesterday’s lesson for me was that we don’t HAVE to get the real wreath to make it Christmas. We don’t HAVE to see the decorations in Brooklyn because it’s the season. We don’t HAVE to get to Jones Beach to drive through the light show because it’ll only be up for a few more weeks. There are no rules. It doesn’t have to feel so chaotic. Christmas will come either way. Let’s enjoy this one and stop worrying about checking things off our list. I have a feeling my children will thank me for it.